Annual to biennial plants with unpleasant odor specific mouse. Root spindly or branched, whitish. Stem 50 - 180 (-250) cm high, at the base 1 - 2 cm in diameter, upright, cylindrical, hollow, smooth or finely knurled, naked or sometimes with gray blue coating in the lower part often reddish brown spots, usually highly branched, often with opposite or three-pointed branches. Leaves dark or gray-green, naked, from 2 to 4 times feather like divided, sometimes opposite or in whorls of 3; lower 3 times feather like divided, widely triangular to broadly ovate, 30 - 60 cm long and 25 - 40 cm wide, with handles; basic and intermediate shares with stems, and the end with the exception of the lowermost sessile; end shares oblong ovate, deeply feather like slashing of ovoid lance, pointed, sometimes with short whitish peak small ahares; middle and upper leaves similar lower, but much smaller and simpler dissected, almost sessile, narrow at the end webbed, with white vaginas. The complex shadows numerous, together form a thyroid whitish inflorescence; the main beams of the complex canopy 12 - 20, inside slightly rough. The shell at the base of the main beams of 5 - 6 ovoid lance, suddenly greatly narrowed and pointed, the edge slightly serrated and curved down leaflets. Sun visors with a sheath of 3 - 6 unilaterally positioned on the outer side triangular lance bracts, the core expanded, and often fused, at the end close tunicates, naked, shorter or slightly longer than the flower stems. Petals about 1.5 mm long and 1 mm wide, white, back ovoid, atop a shallow cut in the recess with a screwed inwards short, overcoat a small share. Fruits 2.5 - 3.5 mm long and as wide, widely ovate to almost globular, gray-green to greyish brown; mericarps transverse The sections broadly elliptical to 5 protruding triangular upper ribs. Economic significance. Poisonous plant because of alkaloid content, the amount of which varies depending on the stage of plant development. Most highly poisonous are unripe fruits which contain up to 2% of alkaloids, mainly Konin (about 1%), which is due to the unpleasant smell of the plant. Fruits also contain essential and fatty oil. Konin holds nicotine like and curare such action. Signs of poisoning occur very quickly with paralysis of the central nervous system, motor and sensory nerves. In medicine, for drugs used Herba Conii et Fructus Conii as analgesic, antispasmodic and sedative agent in asthma, neuralgia, epilepsy, etc., But due to greatest toxicity this application is avoided. Externally applied as poultices for rheumatism, gout, lymphatic inflammation and others. It is also used as an insecticide. 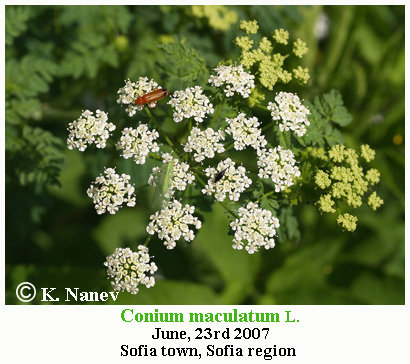 Conium maculatum (hemlock or poison hemlock) is a highly poisonous biennial herbaceous flowering plant in the carrot family Apiaceae, native to Europe and North Africa. A hardy plant capable of living in a variety of environments, Hemlock has been introduced to many other locations outside its range, becoming naturalised in most cases. 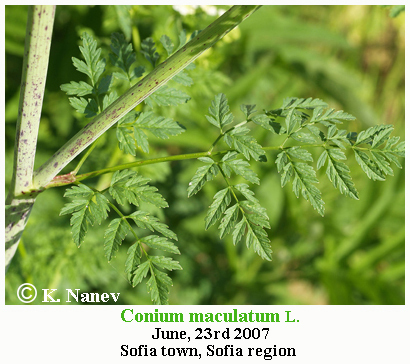 Conium maculatum is known by several common names. 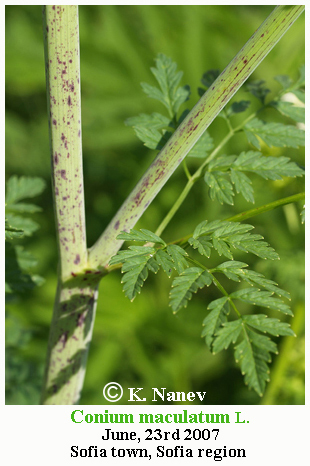 In addition to the English poison hemlock, the Australian Carrot Fern, and the Irish devil's bread or devil's porridge, poison parsley, spotted corobane, and spotted hemlock are used. The plant should not be confused with the coniferous tree Tsuga, also known by the common name hemlock even though the two plants are quite different. The dried stems are sometimes called kecksies or kex. 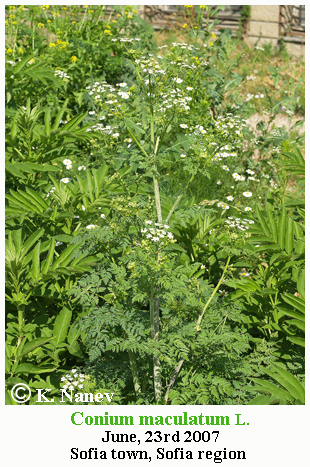 Conium comes from the Greek konas (meaning to whirl), in reference to vertigo, one of the symptoms of ingesting the plant. 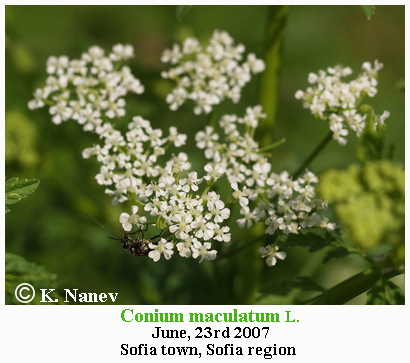 Conium maculatum (hemlock, poison hemlock) is a herbaceous biennial flowering plant in Apiaceae, the carrot family, that is native to Europe and North Africa. It grows to 1.5–2.5 m (5–8 ft) tall, with a smooth, green, hollow stem, usually spotted or streaked with red or purple on the lower half of the stem. All parts of the plant are hairless (glabrous); the leaves are two- to four-pinnate, finely divided and lacy, overall triangular in shape, up to 50 cm (20 in) long and 40 cm (16 in) broad. The flowers are small, white, clustered in umbels up to 10–15 cm (4–6 in) across. When crushed, the leaves and root emit a rank, unpleasant odor often compared to that of parsnips. It produces a large number of seeds that allow the plant to form thick stands in modified soils. 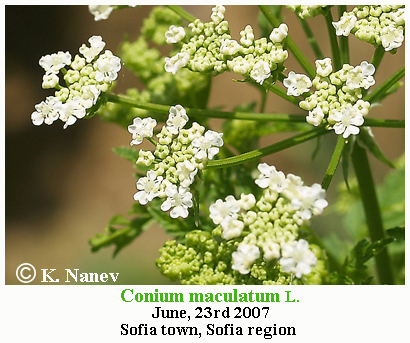 Conium maculatum is native in temperate regions of Europe, West Asia, and North Africa. It has been introduced and naturalised in many other areas, including Asia, North America, Australia, and New Zealand. It is often found on poorly drained soils, particularly near streams, ditches, and other surface water. It also appears on roadsides, edges of cultivated fields, and waste areas. It is considered an invasive species in 12 U.S. states. Conium maculatum grows in damp areas, but also on drier rough grassland, roadsides, and disturbed ground. It is used as a food plant by the larvae of some Lepidoptera species, including silver-ground carpet. 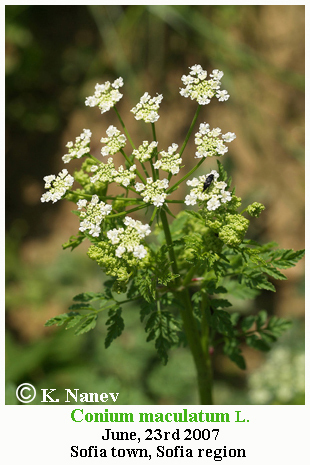 Poison hemlock flourishes in the spring, when most other forage is gone. All plant parts are poisonous, but once the plant is dried, the poison is greatly reduced, although not gone completely. Distribution in Bulgaria: Grow in degraded areas near fences, thorium and trails around housing, near railways, around the uncultivated areas in gardens, but rarely across the field, among the bushes and in the outskirts of forests. Distributed mainly in the plains and foothills and rarely in mountain areas up to 1200 m altitude. (Conspectus of the Bulgarian Vascular Flora) = conspectus&gs_l= Zlc. Distribution: Europe (excluding most northern parts), Mediterranean, Caucasus, Central and Southwest Asia. Transferred in North and South America and New Zealand.